Ensure these opportunities are accessible to all sections of the community, and that our volunteer team reflects the demographics of the city. As a result, Glasgow Women’s Library has obtained the right to use the Charter Mark. 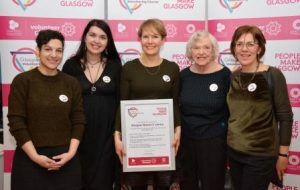 As one of the first five organisations to do so, the team collected their Charter Mark certificate from Volunteer Glasgow on 27th January 2017 (pictured below).